You can still do a barrel roll over Sector Z, but here's why you'll be the only one to see it. Yusuke Amano, the developer who coordinated efforts between Q-Games and Nintendo for the 3DS release of Star Fox 64, has gone on the record with exactly why he chose to shelve online capability, an otherwise seemingly obvious inclusion to the already well-reviewed game. In an interview with Official Nintendo Magazine, Amano discussed the role of multiplayer components and the realistic costs associated. "...just making multiplayer parts of existing games playable online isn't enough to create a satisfying experience for users," he said. "The popular online games work in lots of things, so they play well online - and if we wanted to satisfy everyone who bought the game, the costs required for including online support would be vast." It sounds as if Amano and his team decided that there wasn't enough to the multiplayer experience to justify the expense, especially when compared to other popular online offerings currently available to players. After all, Star Fox 64 includes only two maps and a single mode of play, classic though they may be. In the same interview, Amano then explains the other reason Nintendo kept your Arwing offline: Time. 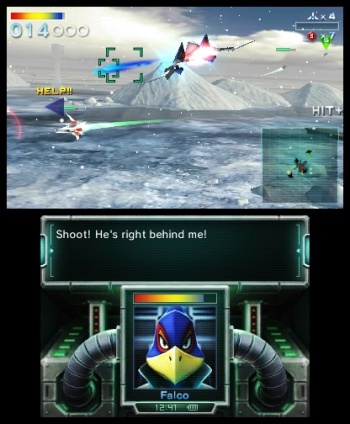 "For this project what we needed to do was use Star Fox to provide users with a game that shows the appeal of Nintendo 3DS as quickly as possible," he explained. "We put a lot of effort into the graphics, and if we had included online support then we couldn't have reached this level in the time allowed." While Amano's honesty is appreciated, I find it a shame that in some small way this title was one more casualty of the 3DS launch hullaballoo. Yes, cost was a primary deciding factor, but from they way Amano describes it, we may have gotten extra multiplayer capabilities had Nintendo been able to use the game as a showcase instead of some sort of rushed proof of concept for the console. Still, things may change if the Star Fox franchise lives on. "We did lots of experimentation for the normal wireless local multiplayer and included lots of new features," Amano said. "Working on the multiplayer part was a nice, satisfying challenge, and if I get the chance to work on another Star Fox title, I would definitely consider an online multiplayer mode."